Air Pollution Scrubbers – Anguil Environmental Systems, Inc.
A great response for your company to take is to invest in high-quality air pollution equipment that works to control your company’s air quality and create a safer work environment as well as reducing the amount of pollution that is sent into the outside air. There are many different avenues to take when it comes to air pollution equipment all of which offer their own advantages to certain applications, meaning one piece of air pollution equipment may thrive in one application while also not being the best choice for another application. In order to determine what type of air pollution equipment you require, you have to understand your application, the conditions of your process as well as the compliance requirements in order to get the right form of equipment. 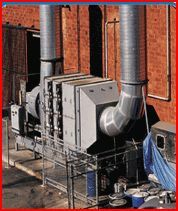 One type of equipment is an air pollution scrubber; this effective form of air pollution control removes particles and even gases from industrial equipment’s exhaust. This form of machinery works by forcing the contaminated gas through a scrubbing liquid, often times this is simply just water. 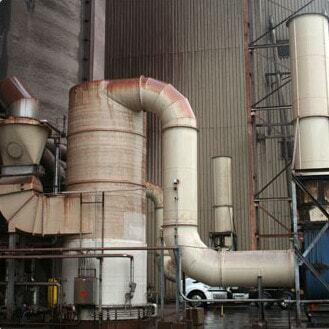 There are a number of different types and styles of air pollution scrubbers depending on your application, such as chemical scrubbers, gas scrubbers, particle scrubbers, ammonia scrubbers, chlorine scrubbers, and so many others. Most air pollution scrubber manufacturers will work with you in order to understand your exact needs and what your application requires especially if you are not aware of what type of air pollution scrubber is right for you, as they all consist of similar parts but also have their own sets of advantages and disadvantages. These types of scrubbers can be found in industrial applications, manufacturing plants, chemical processes, steel making, and many other applications and industries. In order to get the right air pollution scrubber for your unique needs and specifications, contact a trusted and experienced air pollution scrubber manufacturer today. Air Pollution Scrubbers Air pollution equipment is a very necessary part of the manufacturing landscape today due to air quality standards becoming stricter and the general public becoming more aware and sensitive to air quality issues.